Absolutely no benefit. Three Bogus charges appeared on my statement in December 2018 totaling $ 141.61. I contacted Reflex Fraud Management. They sent a new card. I then received a etter - they would investigate. In December Reflex made an adjustment to my account for one of those charges. As of 2/20/19 there has been no further communication from Reflux and the remaining two transactions are still on my account. 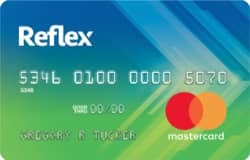 I cancelled the Reflex card because I am unable to trust this company. I did some research on one of the bogus charges and found out the Portillos # 12 OLO has been involved in other fraudulent activities. Why hasn't Reflex located the same information?. I cancelled the card because I have no assurance this will not happen again. Accepted this card when my husband died suddenly 3,000 miles from home. The website has a couple quirks but if you fiddle with it, ultimately everything works. I pay the monthly and annual fee immediately. I keep it at a zero balance. I've considered cancelling but I'm comforted knowing it is there. I'm insulted to have received a pre-approval offer from this company after reading all the reviews. I've never heard of so many fees and charges up front before even being able to use the card. Maybe the card would work for individuals who really need an unsecured credit start or are in desperate need of rebuilding severely damaged credit, if all those fees weren't attached. And to make matters worse, if there is no way to make online payments, no live customer service agents to call and no means of having payments immediately applied to the account for use, the card would truly be of NO USE TO ANYONE. It sounds to me like this card is a "don't do it" waiting to happen. Be smart and "just say no"! No phone app, No Website , Looks Fake As F#%k.... Big Trap. It is really a disgrace that I can't get into the website to pay my bill online. They make it so difficult to pay your bill but our so quick to add late fees when you were trying to pay online. It should be an easy process. I got the card - $500 limit --- I charged $125 on it. The card keeps getting declined now. I tried unsuccessfully to make an on-line payment. What's up with this company??? My credit has been idle for the past 5 years so I decided to add a few cards and received an offer from Relex in the mail about 2 weeks after. Initial offer online stated I was pre-approved but later asked for a $50 deposit. I debated it for a week and paid the $50 security deposit , for a $500 credit line , with a $78 annual fee. So , after receiving the card I find their Website to be antiquated and not user friendly at all . I cannot activate my card although their website says I have a $78 balance due in about 3 weeks , Nor does it give me any option to pay the balance , close my account or talk to a real person. Tried to use my card on Ebay , it was declined multiple times and said I need to contact my card provider. Everyone is different but looking back at the online reviews it said to AVOID this card (and their similar cards) at all cost. I'm not sure what the problem is but I took a 3 point hit on my credit reports for their hard pull inquiry , and none of my credit reports show me opening a new account as of yet , and I applied almost 3 weeks ago. Applied for the card and they said card was sent. Never got the card. They cancelled the card and supposedly sent another. Still waiting. False and misleading advertising. They ask many questions,run credit then come back on line to inform you that you have been "approved" for an secured which the offer was to supposed to have been an "unsecured" credit card which they neglected to say upfront. They put a payment hold on your account for about 7 days - But when you make your payment it says your account will be credited that day - Big rip off! I am going to use this card for 1 year. I'm trying to rebuild my credit. I will read and go over the terms before I use with all the feed back I'm hearing. IF that pay for gas pay off balance every month to build credit. $500 credit limit. Unsecured card. Nothing about this card impresses me, but I am rebuilding my credit so thats why I pulled the trigger on this one. I started with finger hut, then a credit one card and now this one. I will get rid of it as soon as I can, but at least I have it if I need it. It is very annoying that the payment is out of my bank, the credit card company shows the payment has been made and there is no balance owed, but they still won't make that money available to use yet. At least I have a regular card and I am rebuilding my credit, so It will get better. I got a mailer with this card. Annual fee: $125 the first year, then $96. Monthly Maintenance Fee: From 2nd year, $10 a month. I already have Credit One and Opensky before that. Think I will pass on this. The fees look ridiculous compared to the cards I have. For reference, my score is now at 540. I am in the process of rebuilding my credit. I got a mailer for this and decided to apply. The fees are high but I figured that I will only keep this card for up to a year max and cancel before the next annual fee. I applied and was asked to put a $150 deposit. Ended up not activating it. I got the offer in the mail and the terms look like it is the same as what everyone else got. MF: $10 per month from second year. I gave this a skip. I already have a Capital One secured, Opensky secured and more recently a FIngerhut Freshstart (which has been upgraded to a regular account). So no reason to pay all these fees just to get an unsecured mastercard. Got this offer from the mail. The fees are high and so is the APR. I have an existing Fingerhut account but I want a regular Visa or MasterCard and I seem to get rejected even by other similar cards like Credit One, FP and Indigo. So I gave this a shot and got approved for $500. My plan is to charge about $20 a month and pay in full and then cancel after one year. Can't believe that I actually pulled the trigger on this card. But I have been turned down by Citi and Wells for their secured card. So, this is perhaps my ticket to a better score. Just got it but I have been putting about $30-$40 a month on the card and paying it off in full. I notice a payment hold for about 7 days but since I only utilize about 10% of my available credit, it does not bother me at all. Got the pre-approved mail and when I applied, I was asked put a $50 deposit for a $500 limit. I did that and have just started using the card. BTW - the do put a 7 day hold on your deposit so you would not be able to use the card then. I applied and was told to deposit $150. My score was about 585 and I figured that with this score (though not great), I should be able to get a better, lower fee card. So I did not follow up. In fact, about a week later, I got approved for Fingerhut (no fees). Here's a quick warning. They put a payment hold on your account for about 7 days. So it is best not to use up your whole limit. The fees are so high. But I have been rejected by a couple of secured cards and even First Premier! So I was glad that at least someone would give me another chance. The one thing to be aware of is that they put a hold on your payment for about a week. Got the pre-approved mail and applied online. I was approved for $500. Have not used it for long so maybe I'll check in at a later date for an update.